Bob Turner is founder of Turner Investments and a manager of several funds at the investment company. In a recent article he reintroduces the all-important, longstanding debate of active management (“hands-on”) versus passive management (“hands off”) approaches to investing. Mr. Turner makes some good arguments for the active management camp, however some feel differently – take for example Burton Malkiel. The Princeton professor theorizes in his book "A Random Walk Down Wall Street" that “a blindfolded monkey throwing darts at a newspaper’s stock page could select a portfolio that would do just as well as one carefully selected by experts.” In fact, The Wall Street Journal manages an Investment Dartboard contest that stacks up amateur investors’ picks against the pros’ and random stock picks selected by randomly thrown darts. In many instances, the dartboard picks outperform the professionals. Given the controversy, who’s right…the darts, monkeys, or pros? Distinguishing between the different categorizations can be difficult, but we will take a stab nevertheless. Buttressing his argument for active management, Turner references data from Advisor Perspectives showing an inconclusive percentage (40.5%-67.8%) of the actively managed funds trailing the passively managed indexes from 2000 to 2008. Read more about the dirty secrets shrinking your portfolio. According to the Vanguard Group and the Investment Company Institute, about 25% of institutional assets and about 12% of individual investors’ assets are currently indexed (passive strategies). 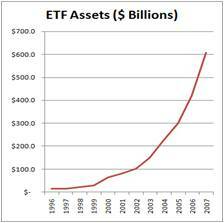 If you doubt the popularity of passive investment strategies, then look no further than the growth of Exchange Traded Funds (ETFs – see chart), index funds, or Vanguard Groups more than $1 trillion dollars in assets under management. Although I am a firm believer in passive investing, one of its shortcomings is mean reversion. This is the idea that upward or downward moving trends tend to revert back to an average or normal level over time. Active investing can take advantage of mean reversion, conversely passive investing cannot. Indexes can get very top-heavy in weightings of outperforming sectors or industries, meaning theoretically you could be buying larger and larger shares of an index in overpriced glamour stocks on the verge of collapse. We experienced these lopsided index weightings through the technology bubbles in the late 1990s and financials in 2008. Some strategies may be better than other over the long run, but every strategy, even passive investing, has its own unique set of deficiencies and risks. As I discuss in my book, there are similarities that can be drawn between professional sports and investing with respect to active vs. passive management. Like the scarce number of .300 hitters in baseball, I believe there are a select few investment managers who can consistently outperform the market. In 2007, AssociatedContent.com did a study that showed there were only 22 active career .300 hitters in Major League Baseball. I recognize in the investing world there can be a larger role for “luck,” which is difficult, if not impossible, to measure (luck won’t help me much in hitting a 100 mile per hour fastball thrown by Nolan Ryan). Nonetheless, in the professional sports arena, there are some Hall of Famers (prospects) that have proved they could (can) consistently outperform their peers for extended durations of time. Experience is another distinction I would highlight in comparing sports and investing. Unlike sports, in the investment world I believe there is a positive correlation between age and ability. The more experience an investor gains, generally the better long-term return achieved. Like many professions, the more experience you gain, the more valuable you become. Unfortunately, in many sports, ability deteriorates and muscles atrophy over time. Experience alone will not make you a better investor. Some investors are born with an innate gift or intellect that propels them ahead of the pack. However, most great investors eventually get cursed by their own success thanks to accumulating assets. Warren Buffett knows the consequences of managing large amounts of dollars, “gravity always wins.” Having managed a $20 billion fund, I fully appreciate the challenges of investing larger sums of money. Managing a smaller fund is similar to navigating a speed boat – not too difficult to maneuver and fairly easy to dodge obstacles. Managing heftier pools of money can be like captaining a supertanker, but unfortunately the same rapid u-turn expectations of the speedboat remain. Managing large amounts of capital can be crippling, and that’s why captaining a supertanker requires the proper foresight and experience. As I’ve stated before, I believe the market is efficient in the long run, but can be terribly inefficient in the short-run, especially when the behavioral aspects of emotion (fear and greed) take over. The “wait for me, I want to play too” greed from the late 1990s technology craze and the credit-based economic collapse of 2008-2009 are further examples of inefficient situations that can be exploited by active managers. However, due to multiple fees, transaction costs, taxes, not to mention the short-term performance/compensation pressures to perform, I believe the odds are stacked against the active managers. For those experienced managers that have played the game for a long period and have a track record of success, I feel active management can play a role. At Sidoxia Capital Management, I choose to create investment portfolios that blend a mixture of passive and active investment strategies. Although my hedge fund has outperformed the S&P 500 in 4 of the last 5 years, that fact does not necessarily mean it’s the appropriate sole approach for all clients. As Warren Buffett states, investors should stick to their “circle of competence” so they can confidently invest in what they know. That’s why I generally stick to the areas of my expertise when I’m actively investing in stocks, and fill in the remainder of client portfolios with transparent, low-cost, tax-efficient equity and fixed income products (i.e., Exchange Traded Funds). Even though the actively managed Turner Funds appear to have a mixed-bag of performance numbers relative to passively managed strategies, I appreciate Bob Turner’s article for addressing this important issue. I’m sure the debate will never fully be resolved. In the meantime, my client portfolios will aim to mix the best of both worlds within active and passive management strategies in the eternal quest of outwitting the darts, monkeys, and other pros. DISCLOSURE: Sidoxia Capital Management (SCM) and some of its clients own certain exchange traded funds but had no direct position in stocks mentioned in this article. No information accessed through the Investing Caffeine (IC) website constitutes investment, financial, legal, tax or other advice nor is to be relied on in making an investment or other decision. Please read disclosure language on IC “Contact” page.